Avocados rank pretty darn high on my list of favorite foods. Being a California girl and all, we’ve got no shortage of them year-round. From giant Pinkertons and Zutanos to the delectably creamy Gwen and Haas varietals, our Golden State has got an avocado for every occasion. Simply put, this pie will blow your mind. 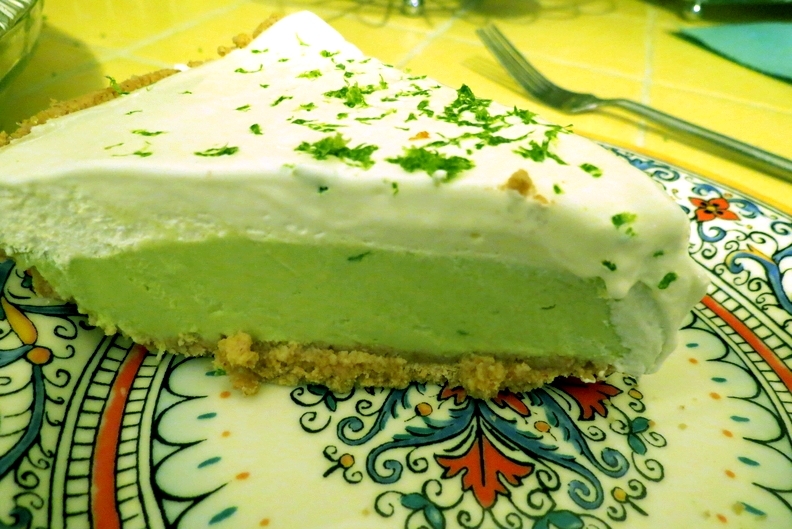 I’m not much of a baker (although to be fair, I haven’t tried much), so when I saw this no bake recipe for Avocado Pie on Evan Kleiman’s Good Food blog a few days ago, I couldn’t get it out of my mind. I had a vague memory of having a similar dessert at a friend’s house growing up, but over the years, the notion of such a thing had fallen into another dimension. Thanks to the internet however, I found out a little more about this wonderful pie (although not enough to really know it’s origins). Also called Jagger Pie, this recipe is painfully easy. I decided to put my own spin on it however so follow the recipe after the jump for a slightly sweet, slightly tart cream pie that will sure to please your friends are this summer’s picnics and barbecues. For the most part, both of these recipes are pretty similar. I decided to use more avocado for a better texture along with key lime and lemon juice, mascarpone, and a dash of salt. I also opted for a whipped cream topping instead of her sour cream topping,but both are very good. 1. Place the avocado flesh in a large bowl with lemon and lime juices. Toss and make sure avocado is fully coated in juice to make sure the fruit does not oxidize and lose its color. 2. Add condensed milk, cream cheese,salt, and mascarpone to bowl and using a hand-immersion blender, blend everything together until smooth. If you don’t have a hand blender, a large food processor is the best alternative. 3. Taste and check for desired sweetness/tartness. If it is too tart, add a little more condensed milk. 4. Pour mixture into crust and smooth with the top with a spatula or butter knife. 5. Refrigerate for at least 6 hours. Overnight works best. 6. Once the pie has set, add whipped cream topping (homemade or store-bought) to the pie and spread evenly across top. Sprinkle with freshly grated lemon zest and place in freezer for at least 30 minutes until cream topping becomes stiff. 7. Cut and serve immediately from freezer and enjoy cold; making sure to refrigerate or freeze any unused portions.